Native to Cameroon in west Africa, lucky bamboo (Dracaena sanderiana) is a member of the Dracaena family and—contrary to its common name and to common belief—unrelated to the bamboo family. Lucky bamboo with a paper lantern. Lucky bamboo, similar to a small tree or shrub, normally grows to a height of approximately 3 feet. "This is one tough little plant, and it is easy to keep it going for a year or more in just water," writes retired horticulturist Gerald Klingaman in an article on the University of Arkansas Cooperative Extension Service website. The growth rate of bamboo is hampered if it fails to receive sufficient light, although it tolerates too little sunlight better than too much, and it thrives with moderate levels of indirect light. The plant expands nicely when grown in water, but it's rate of growth may be limited by the chemicals present in some municipal tap waters. 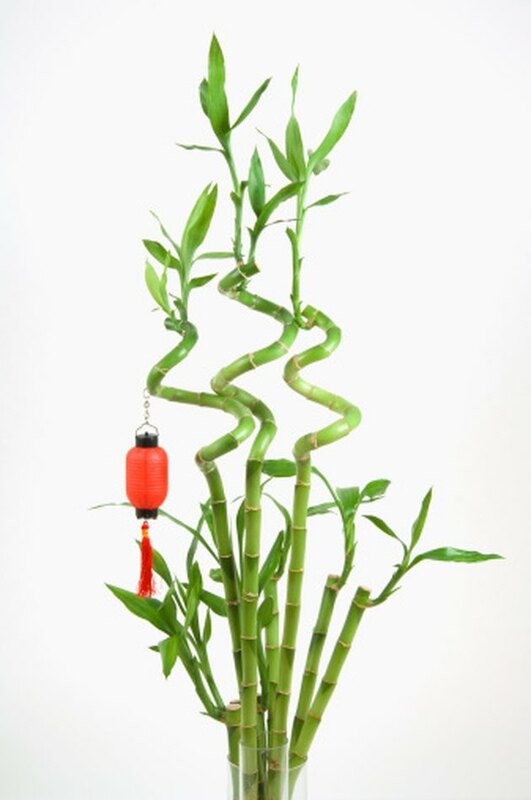 When transplanting a lucky bamboo, the growth rate is largely dependent on the type of cutting implemented. Rooted cuttings may be transplanted if the roots are already established, while tip cuttings require three to four weeks and nodal cuttings must be nurtured for four to five weeks.